We are delighted to announce our plans for our Conference on 25th January 2019 in Titanic, Belfast. In 2004, Belfast & Lisburn Women’s Aid hosted its first “Why Doesn’t She Just Leave?” conference, which highlighted the progress made in developing services and interagency strategies to address domestic violence in Northern Ireland over the previous decades. 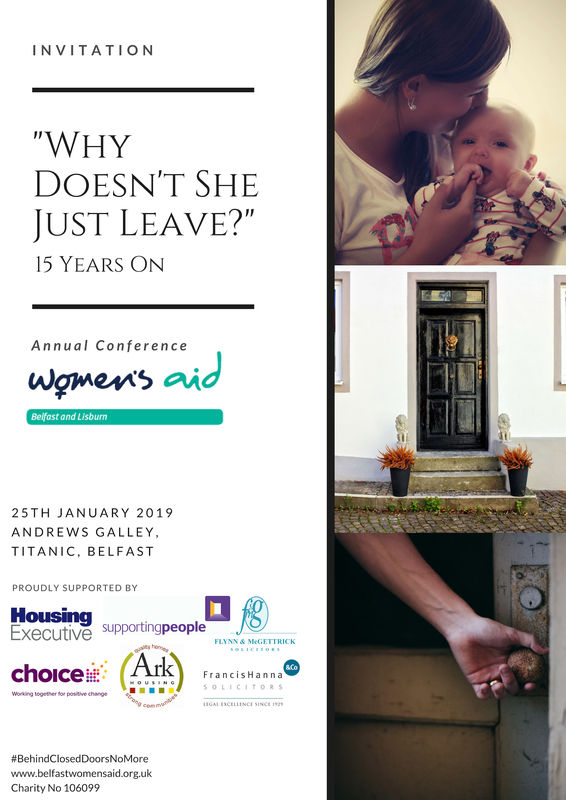 15 years on, our conference will be a reflection of “Why Doesn’t She Just Leave?” and a celebration of the work and commitment of Belfast & Lisburn Women’s Aid and its partner agencies to tackle, prevent and respond to domestic violence. The conference will also contextualise where we are at present within a policy and legislative framework and highlight what more needs to be done in Northern Ireland for survivors of domestic violence. With thanks to our Sponsors, The Housing Executive, Choice Housing, Ark Housing and Flynn & McGettrick Solicitors.